Below is a list of our online products. 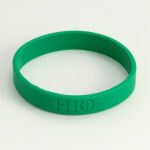 Our first and main product line is the standard HIO bracelet. 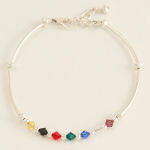 These are made with fire-polished Czech glass beads, genuine Swarovski crystals, sterling silver saucers and components. Adult and children sizes available! Our HIO Tube bracelets are made with Sterling Silver tubes, fire-polished Czech beads and Sterling Silver spacers (either flowers or saucers). Standard size adult only. We have three similar versions of our faith bracelets. They are made with the same sterling silver tubes and components. The difference between the three are in the different spacers used between the tubes. Saucers, balls or flowered beads are used as spacers. These bracelets do not have the HIO logo, instead they have specific color Swarovski glass crystals that represent different faith beliefs. Standard size adult only. Millefiori is Italian for "a thousand flowers". These colorful glass beads are each unique, so we can never duplicate a bracelet. 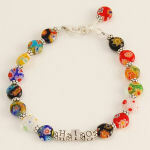 Each bracelet will have its own beautiful multi-color design. Adult and children sizes available! 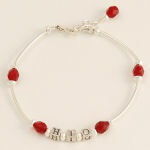 We have many different colors and version of the "HIO" Children's Bracelets. Children size start at 5.75 inches are adjustable to 6.5 inches. Also please see our line of Silicone bracelets that are also made in children's sizes. 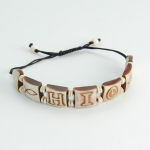 Check out more unique HIO bracelets. Adult and children sizes available! Faithware has partnered with Guardian Village Handicrafts which provides women and impoverished families with fair trade opportunities. See our unique line of Bracelets, Necklaces, Home Decor and other accessories. Various faith related home accents. Various accessories and polishing materials are found on this page. When you are ready to conclude your shopping, please click the "Secure Checkout" button, on the "Shopping Cart" screen to proceed. You DO NOT need to have an account with PayPal to continue. PayPal does provide secure payment processing for us and it DOES NOT require you to open an account with them. Prompts will walk you the rest of the way though the payment process. 1) Please complete your shopping cart and then print out that page. 2) Add a flat rate shipping and handling fee of $5.00 to your order. 3) Wisconsin Residents then must add 5.6% tax to combined product and shipping fees. 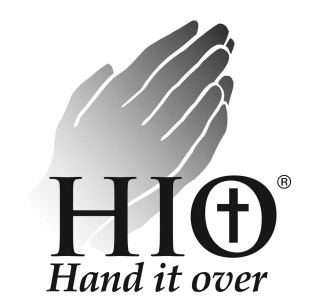 4) Include a copy of your shopping cart form, shipping and contact information including e-mail address (in case we need to contact you), and your payment made payable to Faithware LLC. 6) Order will ship when your personal check clears. If you prefer to order immediately but not over the internet. Please feel free to call us directly at 414-840-4030. We take MasterCard, Visa and American Express. Depending on availability orders usually ship within 24 hours. You will be charged a flat rate shipping and handling fee at the completion of your order. Most orders will ship USPS Priority Mail or First Class - (2-3 days) at the discretion of Faithware LLC. Express mail options are available for additional fees, please contact us if needed. Wisconsin state and county taxes will be charged to Wisconsin State Residents. If applicable, taxes will be added to the shopping cart when all shipping information has been completed. Please contact us for prior approval and a Return Goods Authorization (RGA) number. No products will be accepted for return without an RGA number. Issuance of an RGA number does not acknowledge a product defect or authorize a credit. Products returned due to customer ordering errors may be subject to a 25% restocking charge. Faithware LLC warrants solely to the purchasing party or original gifted recipient, that the products manufactured by Faithware shall be free from defects in materials and workmanship when given normal, proper and intended usage and Faithware will warranty these manufactured products for Life. Other products purchased and resold by Faithware will be warranted for a period of 90 days or by the applicable product manufacturer's warranty.